In a year fraught with many positive changes for Starstruck, again we had so much for which to be thankful in 2003. The BRAHA Spring Show was two days this year with a whole day devoted to jumping! WOW! It was here that Braveheart made his show debut, as did Solidor, Khassi, Dolche and Princess. What a great place to dust off the cobwebs or give the novices their first horse show experience. Nina and Lucy did great in the jumping classes, we had new costumes to show off in Native Costume, and our horses dominated the hack classes in the afternoon! The Bhadurihaucks got a quick lesson in what horse shows are all about, and were old hands by the second and third shows. Kim's new horse PA Solidor and Peggy's new mount Bravehearteclipse each debuted here in both Hunter Pleasure and Working Hunter. This year the show was extended over two days. Hunter Pleasure was included in the first day and Jumping the second. In Hunter Pleasure, *Paradoks+ ended up Champion in the walk-trot, but had some problems in the regular hacks. Solidor, however, shined as champion in the Hunter Pleasure. Kim also brought her four-year-old, Rakhassa Bey. 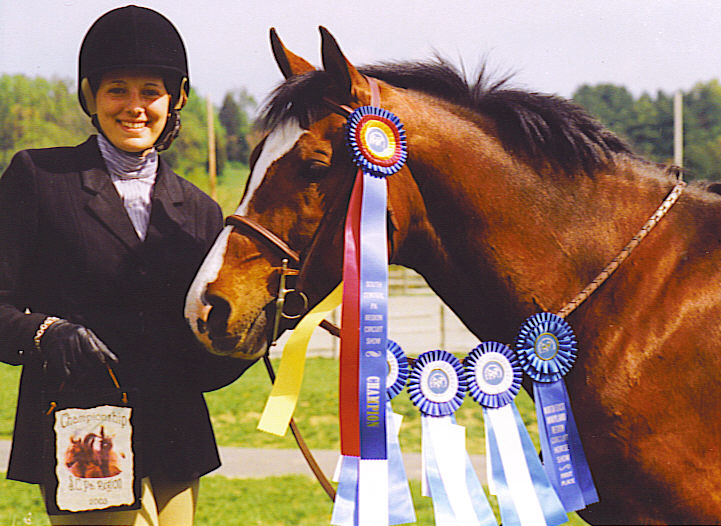 She won her sport horse in-hand class and got a second in a walk-trot class. 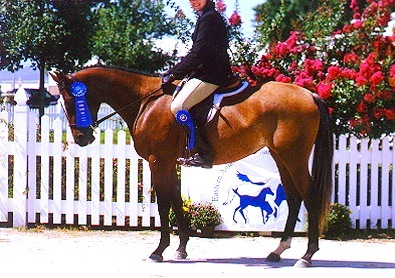 We even brought Mission Accomplished, who won both of his sport horse in-hand classes. He is a yearling who showed for the first time this year. Anjuli brought her two ponies to show under saddle. Then it was jumping day! Cassie brought Opportunity Knocks(Lucy), Kim-Solidor, Peggy-Braveheart, and Surprise, Ginger, Foxy, and Mirage went too. Lucy was Champion in the Baby Green division and Solidor was Reserve!!! Then, in the junior rider division, Surprise was Champion and Lucy was Reserve!!! In the final division, Adult Rider, Solidor was Champion and Mirage was Reserve!!! Then, a gorgeous, wildly-marked HUGE colt foal was born to our leased TB mare, Indian Fern, in May. We named him "Even Exchange," barn name Ricky. The Mason-Dixon Classic, again with splattering mud all over us, was a learning experience for Kim and Soli. PX made it four in a row!! Once again it had rained buckets for this show. Mud made it near impossible to walk around (especially for the dogs). We took Post Exchange+// and PA Solidor to show in the working hunter. Kim started out in the Low hunter and Solidor wasn't too keen about the lake at the far end of the ring. It looked like a sheet of ice and Solidor refused to jump toward it. In the regular working hunter, Solidor had gotten over the mud more and got aroung his courses. Then it was PX's turn. Cassie rode him and did great! He won both of his over fences classes and was second in the hack. He ended up Mason Dixon Champion for the fourth year in a row. Our next event was the May EAAHSC show in Bel Air. Missing our chief cook and bottle washer, Scott, (who was in Spain or China or SOMEWHERE but HERE) was a big change, but we adapted and survived somehow without his humor and help. The first day of the show, Mission Accomplished(Dolche) showed in Partbred Colts Yearling and Younger in the morning. He won that class and it was time to get back to the jumping. Anjuli's pony, Princess, showed for the first time over fences and did great. She got a lot of ribbons and Anjuli was extremely proud of how good she was. Kim didn't do too well, but she is still working things out with her new horse, Solidor. Braveheart did very well and ended up Champion!!! He was awarded a special perpetual trophy in honor of a Northeast MD member that died the year before. 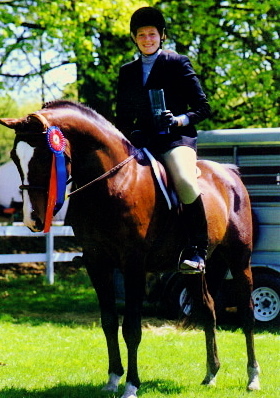 PX did great too, but not in the handy hunter; he was Reserve Champion. Next in Native Costume, Kim And Cassie showed in it, Cassie with *Paradoks+ won First place and Kim got third. In the Hunter Pleasure everyone did pretty well and *Paradoks+ won HP Intermediate Rider 14-18 and was Champion! Braveheart won the Rookie Horse class! On the second day, Dolche won his halter class again and in the jumping PX was Champion and Braveheart was Reserve Champion!!! Then, *Paradoks+ was second in costume. B won the Rookie Horse Hunter Pleasure class again, *Paradoks+ won intermediate rider, B ended up Champion, and *Paradoks+ was Reserve Champion! 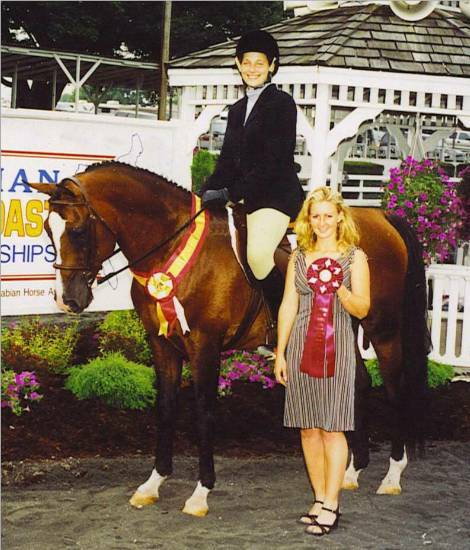 This was the first year we attended the Delmarva Classic Arabian show, as they added Working Hunter to their roster. Everyone had a good time and did well! This was a great show! It started out the first day with Jumping of course and everyone had gotten better. Princess even won the Novice over fences class! Braveheart won the baby green o/f, and Solidor was placing better too. For Native Costume, *Paradoks+ was First place! Later in the Hunter Pleasure, *Paradoks+ won Intermediate Rider and he won Hunter Pleasure Open too!!! Braveheart won rookie horse and Show Hack. 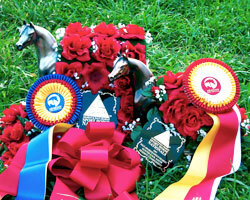 In the Hunter Plearsure Championship, *Paradoks was Champion and Solidor was Reserve. 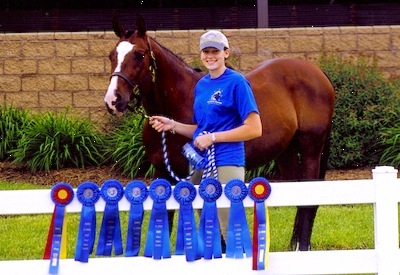 *Paradoks+ won all of his classes that day and Cassie was excited that he did so well. The second day, Dolche won his halter class and we all still did well in the jumping. Surprise won hunter hack, PX won the warm up o/f and the hunter o/f. 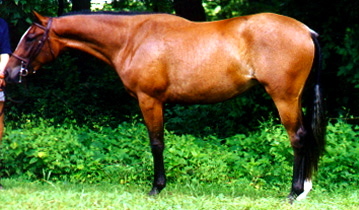 PX was Champion for the Working Hunter. In the Hunter Pleasure *Paradoks+ was Champion, but second in Native Costume. Debbie's new horse, Zeal (Kharry On+), had just arrived a few days before this show. Cassie was to show him in the Working Hunter after only riding him a couple times in her life. 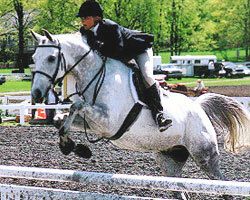 Debbie also brought Nina to jump and for Billy to show in a small schooling show there for Hunter Pleasure. Kim had Solidor to show in hunters and in Hunter Pleasure and we brought Braveheart to do the low working hunter and some Hunter Pleasure too. Also, we brought Post Exchange+// to jump and *Paradoks+ for Hunter Pleasure. Zeal and Cassie got better each time they did another course and placed consistantly. Braveheart did pretty well in the lows and earned a few ribbons too. Solidor didn't have the best trips, but had a lot better luck than at mason dixon and did win some classes and was champion in the Purebred Regular Working Hunter. Cassie still had to show PX and she was worried if she would be able to make a good switch from Zeal to PX. After all, they are very different horses to ride. In the end PX and Cassie had wonderful trips and won all three classes, was Champion, and even won Hunter Hack!!! Now for the Hunter Pleasure. Sol did well much to Kim's delight and earned a second place and a reserve champion.Braveheart showed in show hack and placed first, along with some lower placings in the hunter pleasue! Paradoks went in Native Costume and was Perfect, but placed fourth to some hoses that didn't even have a head set because he was penalized for having vet wrap on his tail to disguise that it was braided. We had no choice but to braid his tail ahead of time so he can have it for Hunter Pleasure which was soon after(at least the vet wrap was purple to match the costume). Anyway He placed well in the Hunter Pleasure and in one of the classes he lost a shoe(just like last year) on the first turn after trotting into the ring. After loosing it he had the biggest trot step ever! Even though his shoe was aluminum too! But with that huge trot and mannerly disposition he won the class!!! Later one evening mom and I decided to do the Combo class for fun. In this class the Jr. rider shows the horse one direction and an amateur family member shows the other direction. We showed Paradoks in this class and got first place. Once again we didn't take any pictures at this show, sorry. Region 15 Championships followed, with Zeal, PX and Sol making the trip south. After the trip down to Lexington, we got the horses stalls set up and took them for a nice walk. When it was show time, Sol and Zeal were up first. Cassie and Zeal had great courses and pinned second in each. They were well on their way to a Reserve Champion. Sol and Kim tried their best, but had some mistakes that caused low placings. In the under saddle section, Zeal was being a handful. While cantering the second direction he started to take off! Cassie circled him to slow him down, but he swapped leads and tried to take off again. His chances for Reserve were suddenly gone. He still managed to be a Top Five which was still great news. Then with PX, Cassie had good courses on him, but he had trouble getting lead changes on the short, rounded turns. He hacked well, but overall pinned right outside of the top spots. We still had fun and it was a good experience for Kim and for Cassie with Zeal. The big MOVE to our new digs in Monkton, MD occurred somewhere in here...its a blur! But all equines adjusted well to the change. EAAHSC Dillsburg show was a huge success for the team members...fun weekend despite the drive to the middle of nowhere! Jumping wasn't included in this show except for Hunter Hack. Kim decided to sit this one out, but we all still had fun. Even Scott was there! 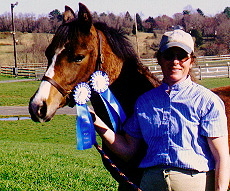 Dolche was first up for his halter class and brought back a blue ribbon. Then it was time for Native Costume. *Paradoks+ showed and was first place. Billy brought Superman to show in the walk-trot and did great winning a Resreve Champion! Next in the hunter pleasure, *Paradoks+ first lost a shoe, but it didn't stop him! He went on to win HP Intermediate, Open, and was even Champion! He won all of his classes that day! Braveheart won Reserve Champion in HP. Last was hunter hack. While warming up, PX lost a shoe! In the end though PX won hunter hack. The second day, Dolche won his halter class again! *Paradoks+ was second in costume, and Billy and Super did even better winning Champion in the walk-trot. *Paradoks+ again won Intermediate Rider, HP Open, and the Championship!!! Cassie was so happy that he did so well all weekend. PX was second in hunter hack and we were ready to go home! East Coast Championships at Quentin ended up with just Cassie and PX going; Kim scratched at the last minute, so it was just us! The HA/AAWorking Hunter divisions included some new competition this year. In the open division, PX and Cassie had two good courses and was second in each and in the Under Saddle section. They earned an East Coast Reserve Champion!! Then in the amateur division in the first course PX must not have been fully awake, knoking down a rail on the first fence(those darn single fences!). They were second in the next course which they layed down well. PX also placed second in the u/s again. The show was fun and easygoing. We had a great time and we can't wait until Quartermaster attends this year in 2004!!! Howard County Fair was its usual good time, despite our trailer being side-swiped on the way there, causing two flat tires! Once we got to the show, we had missed the Hunter Hack class due to the accident, but were just in time for Dolche's(Mission Accomplished's) conformation classes. We got him off the trailer, put his bridle on and rushed to the ring. Poor little Dolche having to show right away and he was perfect. 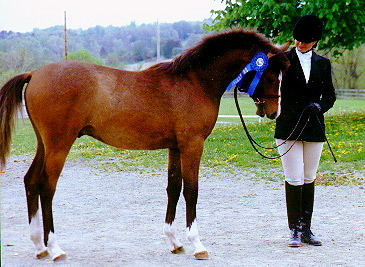 He won his Partbred yearling and younger class and was second in the Open 2 & Under class. He proceeded to the Partbred Championship and was Reserve Champion!!! *Paradoks+ had been chosen to do the Native Costume demonstration for BRAHA. He and Cassie did the demo and won first inthe real class. Braveheart with Peggy and Superman with Billy entered the walk-trot classes and had very nice rounds. They placed well too with first places and a Champion. Braveheart and *Paradoks+ also showed in the Hunter Pleasure. *Paradoks+ won all of his classes an was Hunter Pleasure Champion!!! Braveheart got some seconds to *Paradoks+ and also had good trips! We took Dolche and Rain(All Good Things) to show in conformation. At the Hunter-Breeder shows it is tough for arabs to place against the other non-thoroughbreds. 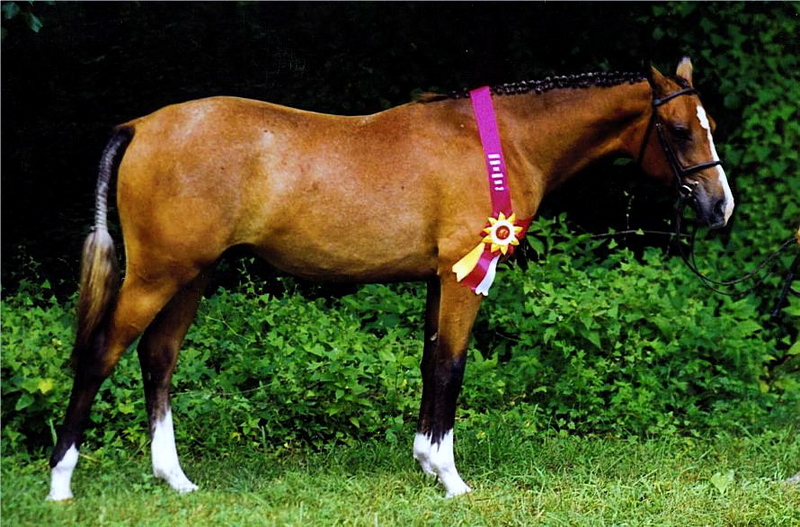 Most of the other non-TBs are Warmbloods or Warmblood crosses. They are the huge, big bodied, hunters(just what they look for). Our Anglos seem to do petty well though! Dolche's class was first and he placed Third; not bad. Then Rain showed with about 12 horses in her class. She was overall Fourth. The horse that won ended up Grand Champion everything! That was a great placing. Dolche and Rain also placed second in the Get of Sire class! Then, in the sporthorse classes Dolche won First Place!!! Rain wasThird in her huge sporthorse class! What can I say?? Scott joined us for one of the few shows he could attend, and he cooked up a storm! Always a fun show, we all had a blast. Rain won her walk-trot class both days! Everyone had fun and did well showing. The EAAHSC Futurity took place at this show too so we decided to bring Rain along for the ride. Only being two years old Rain was going well under saddle so we also decided to take her in the two walk-trot classes each day. PX, Braveheart, Zeal, Solidor, Surprise, Princess,and Mirage showed in the jumping classes. The first day of jumping everyone did well especially Debbie her first time showing Zeal. Kim came out on top as Champion in the jumping and Debbie was Reserve!!! At the same time, Dolche and Rain had to show in halter. We showed Rain too since she was already there anyway. Pam had to show Dolche and he was Second. Rain was against all Pintos in her 2 and 3 year old class. Then it was time to rush for costume with *Paradoks+. Par and Cassie won native costume and then Cassie had to get Rain ready for her first time showing under saddle. Rain behaved so well and she won BOTH walk-trot classes!!!!!! Cassie trained Rain entirely by herself and she was so proud of Rain. Now, we had to get ready for Huunter Pleasure. Solidor was a superstar in the HP winning Adult HP, Open, and the Championship and *Paradoks+ won Intermediate! Princess won HP Go As You Please. In the futurity, Rain was third and against all pintos again. On the second day, everyone did well again! Jumping went smooth except for Debbie getting thrown off. Braveheart was Champion with PX Reserve!! In halter Cassie got to show Dolche and he was First place! Rain beat some of those pintos in her class ending up third. Native Costume was fun except for the rush and *Paradoks+ was second place. Rain was graet again in the walk-trot, but the judge wanted them to back while they were in the lineup. Since she's only two, she didn't know how to yet. She was second in both! In the Hunter pleasure, we moderately placed, but *Paradoks+ won HP Intermediate Rider, Sol was Champion and *Paradoks+ was Reserve! EAAHSC Council Show at Dillsburg was just one horse show too many....horses and riders alike were tired of showing....nerves were frazzled, but we still had superstar performances! We overall had a great show even if the time spent there wasn't as pleasant as usual. We left Dolche home for this show so it was just PX, *Paradoks+, Braveheart, Solidor, Princess, Surprise, and Zeal. In the jumping, they had added a few classes making it run later than usual. The judging was different both days, we still managed to come out on top. To everyone's surprise, Princess ended up Champion!!!!! Braveheart was Reserve. It was a hard rush for Native Costume as they did not hold the lunch break for the hunters and Cassie had to get Alex to hold PX at the jumping ring to wait for the jog order while she got *Paradoks+ and herself dressed for costume. With a limited warm up *Paradoks+ was second in his class. Then in Hunter Pleasure *Paradoks+ was a superstar. He won Intermediate, Open, and the Championship!!! Braveheart pinned great not far behind *Paradoks+. Kim didn't do as well as she had hoped after her time at Delaware, but Sol did make Reserve. On the Second Day there wasn't much change, but in the jumping, B came out on top as Champion and PX was Reserve. It was the same situation with Native Costume and Paradoks was second. The Hunter Pleasure went excellent for Cassie and Paradoks as they won all of their classes and were Champion!!!! Braveheart pinned well too winning a second in the Adult and a third in Open and the Championship! To our surprise, Sol wasn't with the judges, but it was alright. We went for a nice walk on the horses after their classes. 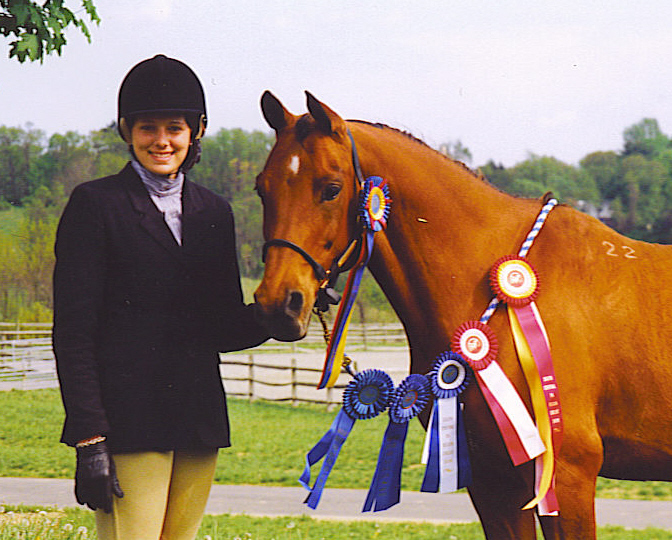 And, finally, the inaugural AHA Sport Horse National Championships. Click to read the saga. 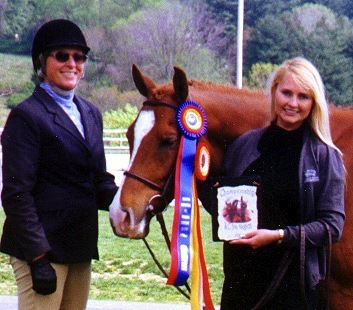 PX ended his career on a mega-high note, Debbi got her first taste of a National level show, Cassie was short of Reserve Champion by a hair, and Kim succeeded in her goal for Sol.